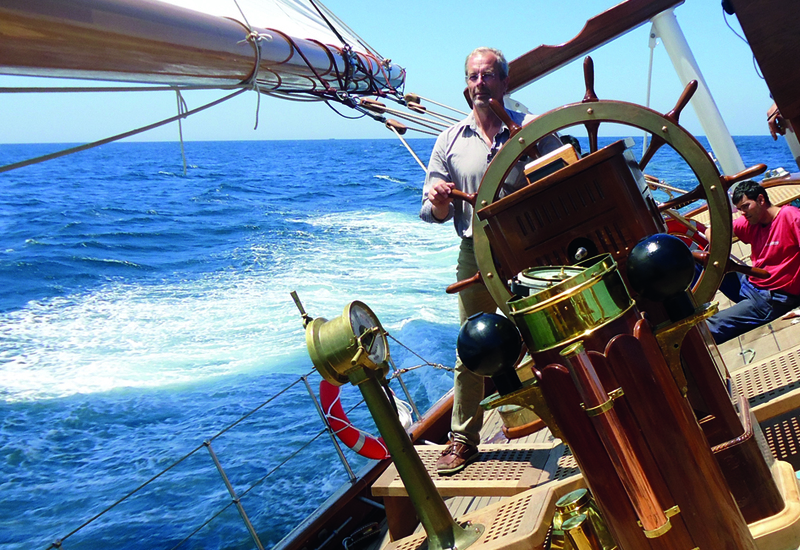 Detlev Loell and Partner is specialised in design, engineering and building supervision of classic sailing yachts and commercial tallships of any size. The company was founded in 1991 and was involved in the design and production of some of the most impressive sailships ever seen. For example the 59m racing schooner ‘Germania Nova’, delivered in 2011, was built in Spain under our supervision and project management. The rigging of the largest full ship, the 138m ‘Sea Cloud Hussar’ was designed in our offices. We, this is the 56 years old CEO of the company, Detlev Loell, mastercraftsman of boat and shipbuilding, chairman of the German shipsurveyors association, member of SNAME, VMVS, BVWW and his team of highly specialised engineers, riggers and sailship specialists. The very well experienced team (nearly all of them more than 20 years in the job) is multilingual (German, English and Spanish), the education ranges from captain to ship building engineer and designer. The team is travel-ling the world to accomplish the jobs where ever needed. Our main office is situated at the harbor waterfront of Peenemuende, Germany with airfield and trainstation in 5 minutes reach. We have our own workshops for mock-up construction and building of wooden boats. We have additional offices in Hamburg/Germany and Vigo, Spain. We use the latest design program on our multi screen workstations, cooperate with the Technical University of Kiel for windtunnel and hull resistance tests to get the best performance and the most comfortable ride. We cooperate with DNVGermanischer Lloyd and Lloyd’s Register. We are well seeked specialists for large gaff riggs and square riggs. We do annual surveys, cost evaluations, project management, consulting works. We organise new buildings, overhauling, upgrading, repairs and refit works wherever our customers want. Our experience comes from our sailing journeys across the Atlantic, sailing up north to Greenland, Island, Spitzbergen, but also south to Antarctic on gaff cutters and square riggers, racing the North Sea with full riggers or barks, building wooden sailing ships in Ireland or Sultanat Oman, steel ships in Holland, Spain or France, Alloy riggings in Russia, surveys in Singapur or Rio the Janeiro, sea trials in Italy or Spain, managing training ships and commercial yachts.